The AXA DESIGN range of audio distribution devices give you cost effective and simple integration between your Philips Dynalite automation system and your audio system, no need for extra controllers as full audio control can be achieved from any Dynalite panel or user interface. On Selected products, devices can also be controlled from RS232, RS485 or Ethernet enabled third party devices, so if you are using an automation system other than Dynalite, AXA will still have a solution for you. The AXA DESIGN CN Series digital audio distribution products are designed to offer maximum flexibility in distributing multiple sources over a simple to use data network. The range of modular products minimises cabling needs and provides flexibility to expand a systems inputs and/or zone outputs. 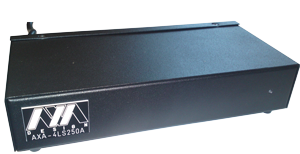 The AXA 4CNS850A features 4 stereo or 8 mono local analogue source inputs. These inputs are available locally to the zones fed from this amplifier or over Ethernet to other 4CNS850A amplifiers. Distributed over a standard 100MB Ethernet network up to 64 mono or 32 stereo inputs can be sent to a limitless number of outputs. By connecting multiple 4CNS850A amplifiers to an Ethernet switch local input sources from each amplifier can be distributed to any output zone so music can be enjoyed in multiple areas simultaneously without disrupting others. Accommodates the latest in smart control and automation systems by being controllable via RS232, RS485, DyNet and Ethernet. 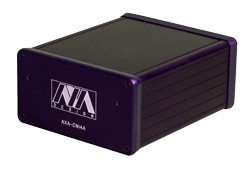 The AXA-CNI4A is a 4 stereo or 8 mono source analogue input to Ethernet output module. By combining the AXA-CNI4A and AXA-CNO4A modules a variety of sources can be enjoyed in multiple areas simultaneously without disrupting others. Accommodates the latest in smart control and automation systems by being controllable via DyNet, RS485 and Ethernet. The AXA-CNO4A is a Ethernet to 4 stereo or 8 mono zone output module. With 4 stereo or 8 mono zone outputs the AXA-CNO4A provides the ability to listen to up to 8 sources in different areas (zones) simultaneously. AXA Design’s AXA-4LS250A is a two zone audio controller ideal for controlling small applications that only require two zones of control e.g. hotel rooms, small apartments etc that are able to follow source and volume of another zone e.g. kitchen and dining or lounge and deck etc. The unit can switch two groups of speakers in three options via Dynet, speakers A alone, speakers B alone or speakers A & B together at the same time. AXA Design’s AXA-SPEAKER TOM is a two zone speaker switch ideal for controlling an extra zone that is able to follow the source and volume of another zone e.g. kitchen/dining or lounge/deck etc.. The AXA-HME21 is used as a simple 2 input x 1 output analogue preamp. The AXA-HME21 is controlled via Dynet and can switch between 2 source inputs. The unit has volume bass and treble control of the line level output. The AXA-POD provides iPod™ control via a Dynalite network. Preset messages are used to navigate through the iPod’s menus, skip to next or previous play list / album / song, play, pause, shuffle, repeat and iPod on/off control is also available. When an iPod™ is docked it can be automatically selected as the audio input and then the Dynalite keypads / touch screens can control the basic functions. The Audio output is fixed and the volume can be adjusted by a downstream amp regardless of what level the iPod’s volume is set at. A classic iPod™ can be charged while docked. Track and Album info is not available over the Dynet network. 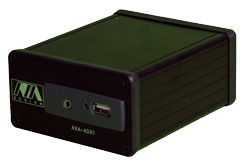 AXA Design’s AXA-ADX1 is a unit that allows playback of MP3’s on a USB via a Dynet command. Ideal for playback of announcements, Warning or notice tones e.g. Door bell, RSL odes, shopping centre announcements etc. By plugging a USB into the unit the audio out can then be connected into a matrix or CNI4A to distribute audio to any zone.